What is heart valve repair or replacement surgery? The heart is a pump made of muscle tissue. It has 4 pumping chambers: 2 upper chambers, called atria, and 2 lower chambers, called ventricles. 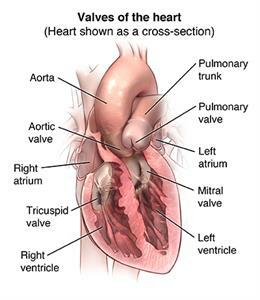 Valves between each of the heart's pumping chambers keep blood flowing forward through the heart. When valves are damaged or diseased and do not work the way they should they may need to be repaired or replaced. Conditions that may cause heart valve dysfunction are valve stenosis (stiffness) and valve regurgitation (leaky valve). When one (or more) valve(s) becomes stenotic (stiff), the heart has to work harder to pump the blood through the valve. Valves can become narrow and stiff from infection (such as rheumatic fever or staph) and aging. If one or more valves become leaky, blood leaks backwards, which means less blood is pumped in the right direction. Based on your symptoms and the overall condition of your heart, your healthcare provider may decide that the diseased valve(s) needs to be surgically repaired or replaced. Traditionally, open-heart surgery is used to repair or replace heart valves. This means that a large incision is made in the chest and the heart stopped for a time so that the surgeon can repair or replace the valve(s). 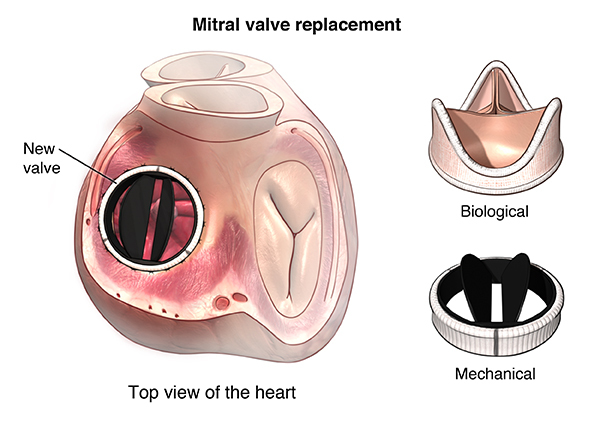 Newer, less invasive techniques have been developed to replace or repair heart valves. Minimally invasive procedures make smaller incisions, and mean less pain afterward and shorter hospital stays. The diseased valve may be repaired using a ring to support the damaged valve, or the entire valve may be removed and replaced by an artificial valve. Artificial valves may be made of carbon coated plastic or tissue (made from animal valves or human valves taken from donors). You and your healthcare provider will talk about the pros and cons of each type and what might be best for you. Why might I need heart valve repair or replacement surgery? 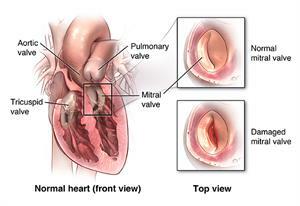 Valve repair or replacement surgery is done to correct the problems caused by one or more diseased heart valves. There may be other reasons for your healthcare provider to recommend heart valve repair or replacement surgery. What are the risks of heart valve repair or replacement surgery? How do I get ready for heart valve repair or replacement surgery? Along with a complete medical history, your healthcare provider may do a complete physical exam to make sure that you are in otherwise good health before surgery. You may need blood tests or other diagnostic tests. You will be asked to fast (not eat or drink) for 8 hours before the procedure, generally after midnight. Tell your healthcare provider if you are sensitive to or are allergic to any medicines, iodine, latex, tape, or anesthetic agents (local and general). Be sure your healthcare provider knows about all medicines (prescription and over-the-counter), vitamins, herbs, and supplements that you are taking. Tell your healthcare provider if you have a history of bleeding disorders or if you are taking any anticoagulant (blood-thinning) medicine, aspirin, or other medicines that affect blood clotting. You may be told to stop some of these medicines before surgery. Your healthcare provider may do a blood test before surgery to see how long it takes your blood to clot. Tell your healthcare provider if you have a pacemaker or any other implanted cardiac devices. If you smoke, stop smoking as soon as possible. This improves your chances for a successful recovery from surgery and benefits your overall health status. What happens during heart valve repair or replacement surgery? Heart valve repair or replacement surgery requires a stay in a hospital. Procedures may vary depending on your condition and your healthcare providers practice. The surgical team will position you on the operating table, lying on your back. A healthcare professional will start an intravenous (IV) line in your arm or hand for injection of medicine and to give IV fluids. More catheters will be put in blood vessels your neck and wrist to monitor the status of your heart and blood pressure, and to take blood samples. Your doctor will put a breathing tube through your mouth into your lungs and connect you to a ventilator, a machine that will breathe for you during the surgery. Your doctor will place a transesophageal echocardiogram (TEE) probe into your esophagus (swallowing tube) so he or she can monitor the function of the valves. A soft, flexible tube (called a Foley catheter) will be put into your bladder to drain urine. Someone on the surgical team will clean the skin over your chest with an antiseptic solution. If there is a lot of hair at the surgical site, it may be shaved off. If you are having an open-heart surgery, your healthcare provider will make an incision (cut) down the center of the chest from just below the Adam's apple to just above the navel. If you are having a less invasive procedure it may require smaller incisions. The sternum (breastbone) will be cut in half lengthwise. The healthcare provider will separates the halves of the breastbone and spread them apart to expose your heart. To do the valve repair or replacement, your doctor must stop your heart. He or she will put tubes into the heart so that the blood can be pumped through your body by a heart-lung bypass machine while your heart is stopped. Once the blood has been completely diverted into the bypass machine for pumping, your doctor will stop your heart by injecting it with a cold solution. When the heart has stopped, your doctor will remove the diseased valve and put in the artificial valve, in the case of a valve replacement. For a valve repair, the procedure done will depend on the type of valve problem you have, for example, your doctor may separate fused valve leaflets, repair torn leaflets, or reshape valve parts to ensure better function. Once the surgery is done, your doctor will shock your heart with small paddles to restart your heartbeat. Next, he or she will allow blood circulating through the bypass machine to re-enter your heart and remove the tubes to the machine. Once your heart is beating again, your doctor will watch it to see how well the heart and valves are working and be sure that there are no leaks from the surgery. Your doctor may put wires for pacing into your heart. He or she can attach these wires to a pacemaker outside your body for a short time and your heart can be paced, if needed, during the initial recovery period. Your doctor will rejoin the sternum sewing it together with small wires (like those sometimes used to repair a broken bone). Your doctor will put tubes into your chest to drain blood and other fluids from around the heart. Your doctor will sew the skin over the sternum back together and close the incision with sutures or surgical staples. A member of the surgical team will apply a sterile bandage or dressing. 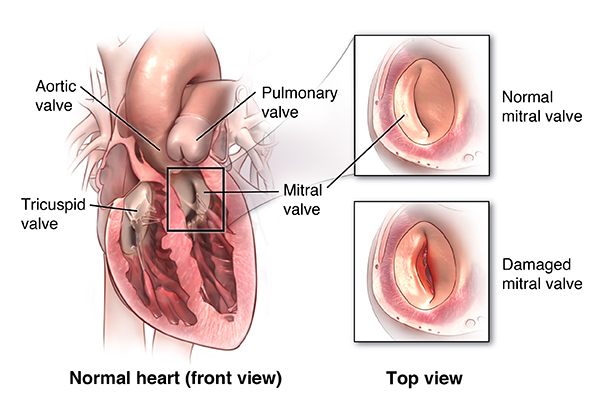 What happens after heart valve repair or replacement surgery? After the surgery, a member of the surgical team will take you to a recovery room and later the intensive care unit (ICU) to be closely monitored for several days. A nurse will connect you to machines that will constantly display your electrocardiogram (ECG) tracing, blood pressure, other pressure readings, breathing rate, and your oxygen level. Open-heart valve repair or replacement surgery generally requires an in-hospital stay of several days or longer. You will most likely have a tube in your throat that's connected to a ventilator to help you breath until you are stable enough to breathe on your own. As you wake up from the anesthesia more and start to breathe by yourself, your doctor can adjust the breathing machine to allow you to take over more of the breathing. When you are awake enough to breathe completely by yourself and are able to cough, your doctor will remove the breathing tube. He or she may also remove the stomach tube at this time. You will get pain medicine if you are hurting. Ask for the medicine before you become extremely uncomfortable. You may be on IV (intravenous) medicines to help your blood pressure and your heart and to control any problems with bleeding. As your condition stabilizes, your doctor will gradually decrease then stop these medicines. He or she will also remove any pacing wires in your heart you may have. Once your doctor has removed the breathing and stomach tubes and you are stable, you may start to drink liquids. You can start eating more solid foods as soon as you can tolerate them. When your healthcare provider decides that you are ready, you will be moved from the ICU to a surgical unit or acute care unit. Your recovery will continue there. Your activity will be gradually increased as you get out of bed and walk around for longer periods. A member of your healthcare team will arrange for you to go home and schedule a follow-up visit with your healthcare provider. Once you are home, it will be important to keep the surgical area clean and dry. You will be given specific bathing instructions. Your doctor will remove the sutures or surgical staples during a follow-up office visit, if they were not removed before leaving the hospital.